Two university sports programs and their longtime coach will soon join the Sports Hall of Fame in Missouri. 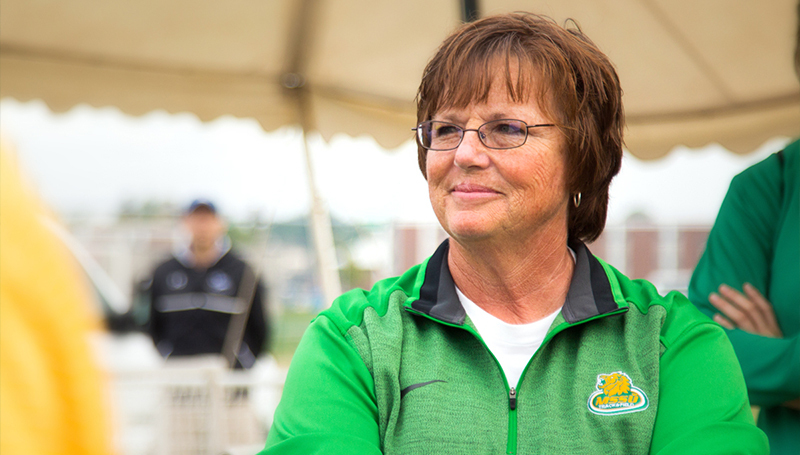 The Missouri Southern Women’s Track & Field and Cross Country programs and coach Patty Vavra will be honored during the Sports Hall of Fame’s annual Women’s Sports Luncheon in Springfield on Wednesday, March 28. Vavra, now an associate professor of Kinesiology, came to Missouri Southern in 1994 as the Head Women’s Track and Field/Cross Country Coach and instructor for the Kinesiology Department. She had an illustrious career, spending 22 years as coach of the teams until her phased retirement in 2016. She led Southern to seven MIAA Cross Country Championships as well as numerous indoor and outdoor titles. She also coached the Lions to an MIAA Triple Crown in 2007-08, winning championships in cross country, indoor track and field and outdoor track and field. She has earned 12 MIAA Coach of the Year awards, seven in cross country (including four in a row), two in indoor track and field, and three for outdoor track and field. Vavra earned the prestigious USTFCCCA Jimmy Carnes Distinguished Service Award in 2014. The event, which is sponsored by the Bee Payne Stewart Foundation and presented by Central Bank and Central Trust will be held at the University Plaza Hotel and Convention Center in Springfield. Tickets are $40 in advance and $50 at the door. For information regarding tickets, contact the Hall of Fame at 417-889-3100.